Sea Frontiers [ISSN xxxx-xxxx] was published between five times a year and monthly by the International Oceanographic Foundation, the inspiration of Dr. F.G. Walton Smith. Volume one appeared in 1954 under the title Bulletin of the International Oceanographic Foundation. 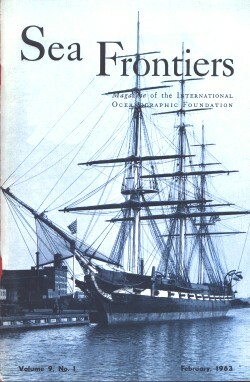 In 1957, with Volume 3, it became known as Sea Frontiers: Bulletin of the InternationalOceanographic Foundation. A companion publication, Sea Secrets, began concurrently and in 1986 the publications united forming Sea Frontiers, Sea Secrets. The volume numbering followed that of Sea Frontiers, i.e. volume 32. This name lasted only about one year until 1988 when the publication became simply Sea Frontiers again with volume 34. Unfortunately, the last issue, volume 42, number 1, was printed in 1996. Our collection is nearly complete from 1960 (Volume 6) to the end of publication, covering many aspects of marine biology, diving, exploration, fishing, shipping and oceanography. Whaling, sealing and the Great Lakes are mentioned. The cover of the February 1963 issue (Volume 9, Number 1) features the USF (United States Frigate [sic]) CONSTELLATION docked in Baltimore in 1914. Indexing: by NMA (partial) is available here. and Nov/Dec 1992 (vol38#6 ), if it was indeed published. We have some duplicates for exchange or possible sale. Please contact us for donations or exchanges.